Since 1908, Law Library Journal (LLJ) has been the official journal of the American Association of Law Libraries (AALL). Scholarly articles on law, legal materials, and librarianship are the mainstay of the Journal. 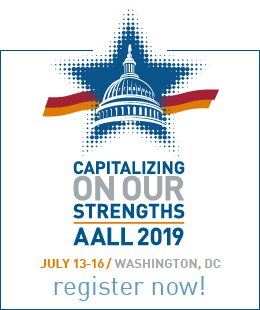 Practice-oriented articles, proceedings of the business sessions of the AALL Annual Meeting, and historical records of the profession and Association are also included. The Journal is published quarterly (winter, spring, summer, fall), and available in digital and print editions. Law Library Journal includes articles in all fields of interest and concern to legal information professionals and others who work with legal materials. Examples include: acquisition and organization of law library collections; services to patrons and instruction in legal research; law library administration; the effects of developing technology on law libraries; law library design and construction; substantive law as it applies to libraries; and the history of law libraries and legal materials. Submissions aimed at all types of law libraries and at all areas of library operations are encouraged. The Journal also encourages the publication of memorials to deceased members of the Association. In preparing a manuscript, an author may use any approach appropriate to the topic: case studies, descriptive or historical narratives, commentaries, or reports on research projects. Bibliographies on topics of substantive law or of law librarianship are welcomed; annotated bibliographies and bibliographic essays are preferred. Manuscripts are accepted for review with the understanding that they have not been previously published, in whole or in part (other than as a working paper made available at a workshop or conference, distributed as part of a working paper series, or posted on an electronic database of working papers), and are not currently being considered for publication elsewhere. Authors are responsible for the accuracy of statements in his or her articles and for the accuracy and adequacy of the references. Citations to published literature should be carefully checked. References to unpublished material may be included; however, the author is responsible for securing approval, in writing, from any person cited as the source of an unpublished work. The author is also responsible for obtaining permission to use copyrighted material. Such permissions should be secured in writing. By submitting a manuscript to Law Library Journal, the author is certifying that he or she has obtained all necessary approvals and permissions. Copies may be requested by the editor. Manuscripts are evaluated for their appropriateness for Law Library Journal, significance, clarity, and style. If accepted, manuscripts will be edited for clarity of expression and to remove any ambiguities in the presentation. If extensive revisions are indicated, manuscripts are returned to authors for approval of changes and corrections before type is set. Throughout the editorial process, the editor’s purpose is to assist authors in effectively communicating their ideas. The editor welcomes advance queries from authors about possible Journal articles. For general questions of style, follow The Bluebook (20th ed. 2015). Textual references and footnotes must be in accordance with Bluebook rule 2. For matters not covered in the Bluebook, use The Chicago Manual of Style (17th ed. 2017). For spelling, use Merriam-Webster’s Collegiate Dictionary (11th ed. 2003), supported by Webster’s Third New International Dictionary. Bibliographies – All bibliographies, whether submitted independently or to accompany a substantive article, should follow the bibliography style described in paragraphs 14.61–14.305 of The Chicago Manual of Style. Prospective compilers of bibliographies or authors of bibliographic essays are encouraged to contact the editor about their projects before committing them to final form to ensure that the works are consistent with the stylistic practices of the Journal. A separate guide, “General Instructions & Sample Entries for Bibliographies,” is available here. Keeping Up With New Legal Titles – This book review column can be found within each issue of Law Library Journal. For more information about the column including its goals and specific guidance for reviewers who suggest and review books for the column, the “Guidance for Reviewers,” document is available here. Title and Author Page Provide a title that is brief, specific, and descriptive of the article’s content. Below the title, provide the name(s), professional title(s), and affiliation(s) of the author(s), and the address of the author to whom correspondence should be sent. Abstract Provide an abstract of 50 words or less. Table of Contents If the article is divided into headings and subheadings (which is preferred), provide a table of contents telling where in the text each heading is found. Text The entire text, including quotations, should be typed double spaced with 1½-inch margins on all sides. Quotations of less than 50 words should be enclosed in quotation marks; quotations of 50 or more words should be blocked off and indented an additional inch on the left and right margins. Footnotes should be identified in the text by superscript numbers. Footnotes Acknowledgments (if any) should be preceded by an asterisk and placed before the first footnote. Footnotes should follow the form of The Bluebook (20th ed. 2015), where applicable. However, citations to Law Library Journal should follow the form of the AALL Universal Citation Guide (3d ed. 2014). Appendices, Bibliographies, Tables, &Illustrations Supplementary materials, such as appendices and bibliographies, should be provided on separate pages. Each table, illustration, and all similar material that is to be published within the text should be individually numbered (e.g., Table 1). Indicate the desired placement by providing an appropriate instruction within brackets in the text (e.g., [Insert Table 1]). Camera-ready artwork must be supplied for all illustrations. Electronic versions in Microsoft Word (preferred) or saved as a PDF may be sent by email. If manuscripts are submitted in paper format, two complete copies should be mailed to the address above. The editor will notify the author that the manuscript has been received and inform the author when an acceptance decision may be expected. After an article has been accepted, the editor will require an electronic manuscript. The author (provide one designated author if there are multiple authors) will receive a clean copy of the manuscript before it is sent to the printer. The copy must be proofread, approved, and returned within 15 days. Before publication, the author must agree to the Journal’s policy on classroom photocopying, which is published in each issue of the Journal and excerpted below. All articles copyright [year] by the American Association of Law Libraries, except where otherwise expressly indicated. Except as otherwise expressly provided, the author of each article in this issue has granted permission for copies of that article to be made for classroom use or for any other educational purpose provided that (1) copies are distributed at or below cost, (2) author and Journal are identified, and (3) proper notice of copyright is affixed to each copy. For articles in which it holds copyright, the American Association of Law Libraries grants permission for copies to be made for classroom use or for any other educational purpose under the same conditions. Upon publication, the author will receive two free copies of the issue and 25 individual offprints of the article. 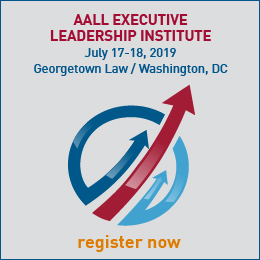 For additional copies or offprints, please contact Heather Haemker, AALL publications manager.